We’re doing a massive amount of work at the City of Lincoln Council to try and improve the service we offer through our website. We want to give our users the best range of services through as many online channels as possible, as well as ensuring that the information on our website is as accurate and accessible as possible. This is all a part of our Customer Access Strategy which is covering all aspects of customer services. We broke the group up into smaller groups and asked them to explore the website, trying to find specific information as well as providing their feedback on the look and feel, navigation, ease of use and quality of information. We roamed the groups during this session, talking individually to people and observing how people attempt to navigate the site. We noticed some interesting things such as how people try to use the search or the A-Z, when they turned up information that shouldn’t be there or when glaring errors were aparent. After the hands on session the group reformed for a discussion in which we talked about their findings and thoughts. The reaction was generally positive which was incredibly reassuring. The panel in general, including those who do not heavily use the site, were convinced that adding a wider range of services would greatly improve customer access and would encourage self service. There was also some interesting discussion regarding the use of social media in which the group was largely split, with those who did not see its worth and those who would welcome improved services in this area, including Facebook and even iPhone apps to provide our services to a wider audience. To finish we asked if anyone would be interested in continuing the consultation online to positive opinion. The next step for me will be to set up an environment where we can openly showcase projects to try and get customer feedback – a development blog if you will. I think that this is an exciting opportunity for the Council to experiment with different online services and strategies and release them for public feedback, much like Google labs. I’m incredibly fired up after this session so hopefully I shall be blogging more about this in the very near future! In the meantime share your thoughts in the comments and let’s get a discussion going. 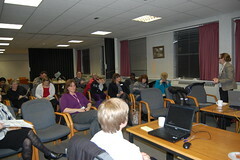 You can also find a set of photos from the evening on the City of Lincoln Council’s Flickr stream. Great! Sounds like it was really worthwhile. When you set up a dev blog, please let us know and let E-gov register know too as they publish them.